The 54th Annual Academy of Country Music Awards were presented on Sunday, Apr. 7, 2019, at the MGM Grand Garden Arena in Las Vegas. Hosted by icon Reba McEntire, country music's biggest party was packed with performances by superstars and newcomers alike: Jason Aldean, Dierks Bentley, Brooks & Dunn, Luke Bryan, Brandi Carlile, Eric Church, Kelly Clarkson, Luke Combs, Florida Georgia Line, Khalid, Miranda Lambert, Little Big Town, Ashley McBryde, McEntire, Maren Morris, Blake Shelton, Chris Stapleton, George Strait, Carrie Underwood and Keith Urban. If you bought a ticket to concert with that line-up, you'd probably have to sell your car. Luckily, it was broadcast live on CBS and audiences got to see Carrie Underwood turn the show into a Vegas pool party, Jason Aldean win the Artist of the Decade award, and the usual Nicole Kidman and Keith Urban adorable lovefest. 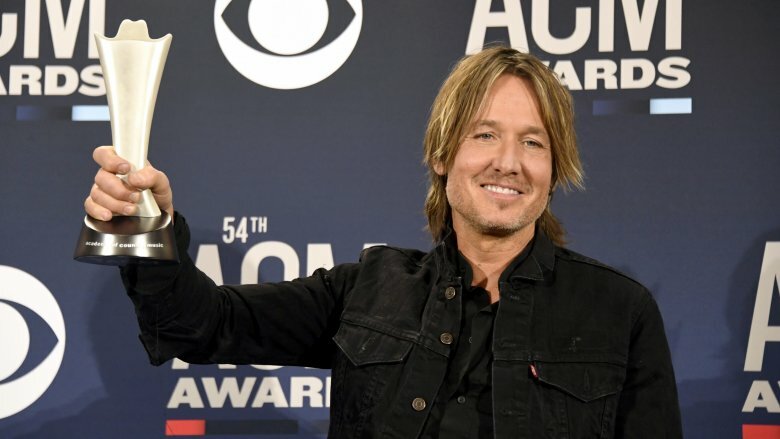 The 2019 ACM Awards was a true celebration of country music and basically scandal-free, so let's take a look at some of night's most memorable moments and one unfortunate miss. 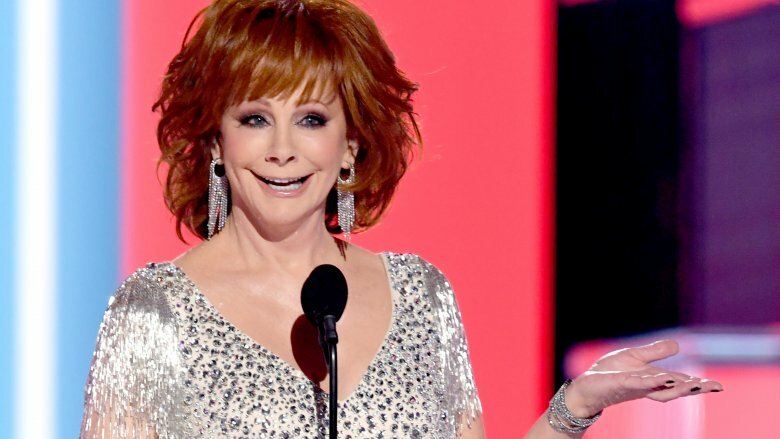 Country music legend Reba McEntire hosted the ACM Awards for a record sixteenth time, and it's easy to see why. She's hilarious. And her opening monologue was no exception. The 64-year-old welcomed the crowd and television audience to "Reba Las Vegas" before saying she never gets tired of hosting. "Tired of celebrating great artists and music, tired of amazing live performances, tired of being in charge of the biggest night in country? Heck no. My name is Reba McEntire, and I haven't been tired in fifty-three years. I'm a woman in the music business, and we don't have time for tired. Now let's get this show started before I need a nap," she joked. She then called out the fact that there were no women nominated for the Entertainer of the Year category. "Do you know it snowed in Las Vegas just a few weeks ago? It was so cold that it froze us women out of Entertainer of the Year," Reba quipped. Shots fired, Reba. But her biggest laugh came courtesy of a Cardi B name drop. "We have some unexpected matchups tonight. Me and Cardi B — I'm just kidding, but I do have a song we can do together," she joked. "There's no U in Oklahoma, and that's OKURR with me." This collaboration needs to happen immediately. In the age of social media, Atlanta rapper Lil Nas X proved there's no longer one way to top the charts. His rap/country hybrid "Old Town Road" caught steam on the app TikTok, blew up YouTube (30 million views in just four months), and quickly went viral. The single's rapid rise, per Rolling Stone, saw it "[debut] on Billboard's cross-genre Hot 100 chart, the Hot Country Songs chart and the Hot R&B/Hip-Hop Songs chart all at once." However, Billboard pulled the song from the country chart (per Rolling Stone), claiming the banjo-friendly hit did "not embrace enough elements of today's country music to chart in its current version." The removal sparked a debate on race and country music, according to The New York Times, who cited Nashville artists like Sam Hunt and Florida Georgia line, who have incorporated elements of hip-hop into their chart-topping hits. You want more country, Billboard? 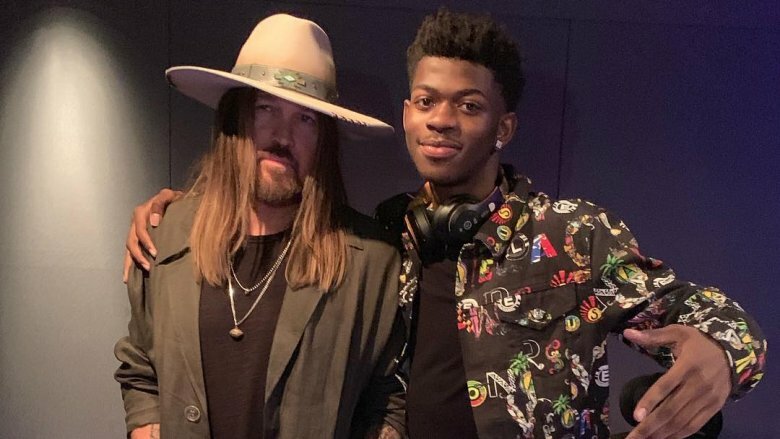 Lil Nas X gave it to you by inviting country legend Billy Cyrus on the remix. "What's not country about it? What's the rudimentary element of a country and western song? Then I thought, it's honest, humble, and has an infectious hook, and a banjo. What the hell more do ya need?" Cyrus tweeted. If the 2019 ACM Awards wanted to break ratings records, they should've gotten Lil Nas X and Billy Ray Cyrus perform. 2019 is Kacey Musgraves' year. 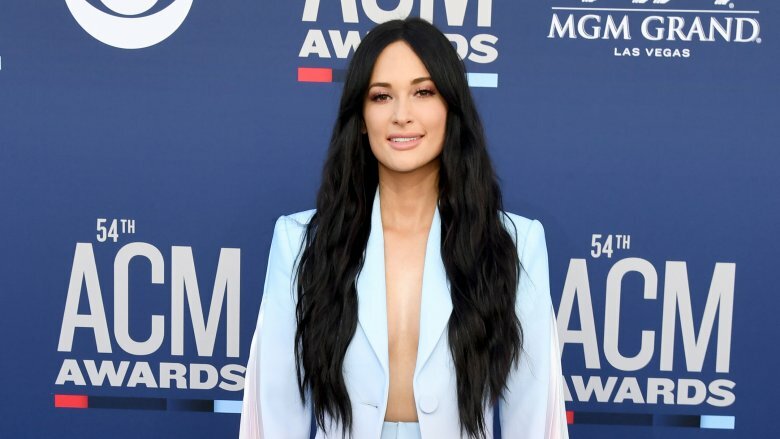 With her win for Album of the Year for her critically-acclaimed third album Golden Hour at the ACM Awards (per People), Kacey Musgraves becomes "the first artist to achieve the trifecta of winning album of the year at the Country Music Association Awards, Grammy Awards and ACM Awards over the course of a year since Taylor Swift." Wow. Her night got even better. Since 2010, Miranda Lambert had won every Female Artist of the Year award. Musgraves broke that streak by taking home the trophy – the first of her young career. "I have to say that this award goes out to any woman, any girl or anybody, really, that is maybe being told that her perspective or her style is too different to work," she said during her acceptance speech (via ET). "It'll work out." We're all looking forward to seeing what Musgraves comes up with next. Country music stars Miranda Lambert andBlake Shelton announced their divorce in 2015. Flash forward four years later to Shelton and his longtime girlfriend Gwen Stefani attending the star-studded show where Lambert performs a medley of her biggest hits spanning her almost two-decade career. Included in the performance (via Fox News) was her hit "Little Red Wagon" with a slight difference — she changed lyric "I live in Oklahoma" to "I got the hell out of Oklahoma." So, what's the big deal? Shelton is from Oklahoma. Oh snap. Fans were quick to notice, heading straight to Twitter to share their thoughts. "Miranda Lambert singing TO AND AT Blake Shelton & Gwen is the type of energy I love," @alithrasher wrote. "Wished they would have shown Blake Shelton's face during Miranda Lambert's performance," @CupofSunshine75 tweeted. "That was a classless move towards Blake, no reason for that. #bitterness #getoverit," @PureBlarney added. However, according to a report from InTouch, Shelton and Stefani "got up during the commercial break and apparently missed" Lambert's performance. It looks like they probably had to find out on Twitter. You know the song. It's probably stuck in your head right now. 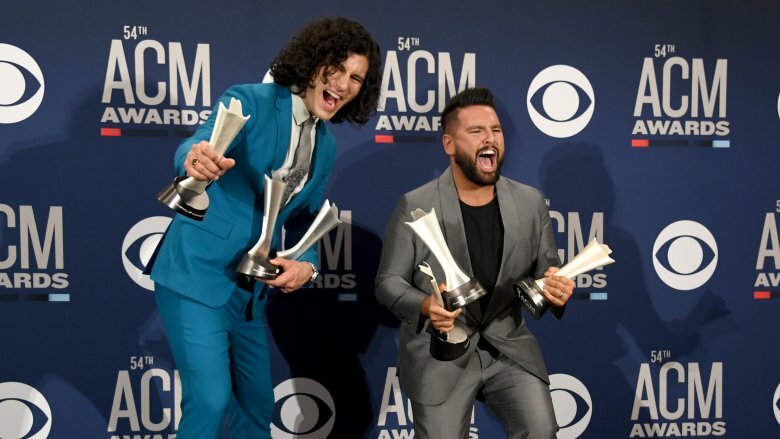 Dan + Shay's hit "Tequila" won big at the ACM Awards, nabbing Song of the Year and Single of the Year. "Thank you to country radio for playing this song," Dan Smyers said during the country duo's acceptance speech (via Taste of Country), "Everybody in country music, thank you so much for accepting us into this family. This is a dream come true for us. We love you. Cheers!" 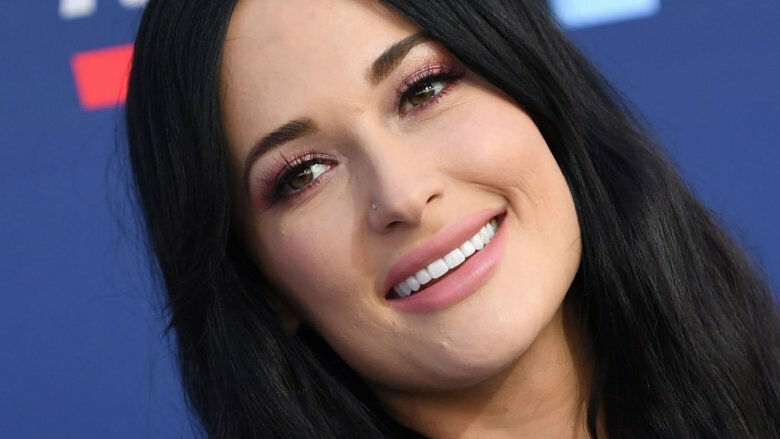 It was an impressive win when you realize other Song of the Year nominees included Chris Stapleton's "Broken Halos" by Chris Stapleton, Bebe Rexha featuring Florida Georgia Line's "Meant to Be," and Kacey Musgraves' "Space Cowboy." The guys capped off their night by performing their single "Keeping Score" with Kelly Clarkson. "We moved to Nashville to write country music, and we're such fans," Smyers told People before the show. "To be a part of this family and have everyone come to Vegas is the coolest thing in the world. Win or lose, it's an honor to be nominated." 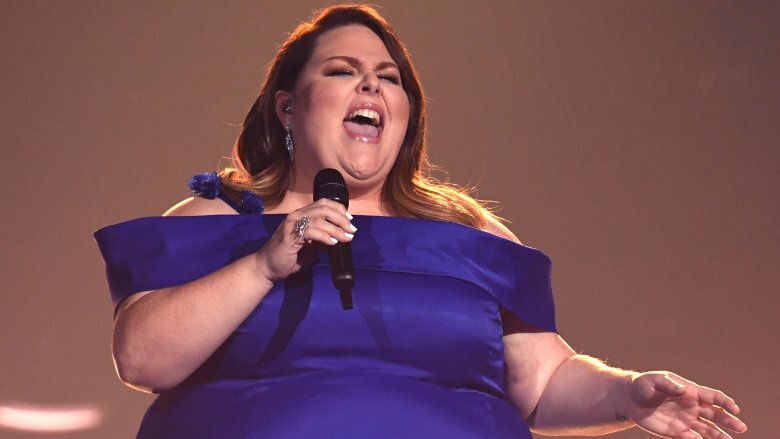 "This Is Us" star Chrissy Metz took the stage at the ACM Awards to perform a powerful rendition of "I'm Standing With You" from her feature film debut, "Breakthrough" (via People). Halfway through, she was joined onstage by country stars Carrie Underwood, Lauren Alaina, Maddie & Tae, and Mickey Guyton. The inspirational ballad brought the house down and cemented Metz as a singer to be reckoned with in the future. "As an actress, you're not always taken seriously as a singer," Metz told USA Today days before the show. "You can't always cross over, whether it's drama to comedy or an actress to musician. I can't even believe it's happening. I really, really can't. It's been a gift on top of a gift." As for the anticipation she felt ahead of the performance? Metz is all of us. "It's one of those bucket list moments you didn't think would actually happen," Metz continued. "Standing on stage with five incredible women who are brilliant vocalists and artists is beyond thrilling." Urban was overcome with emotion as he accepted his award, and made sure to thank his wife first. "Thank you so much. Baby Girl, I love you so much," he said (via People). "My team, thank you every one of you. To the fans out there, you are amazing. You have no idea what you mean to me. No idea," he continued. The "Blue Ain't Your Color" singer then thanked his and Kidman's two daughters. "Baby Girl, I love you and our girls, Sunday and Faith, who are at home watching right now," Urban added. "My whole team … I love you guys … Country radio, I love you so much. Thank you so much. God bless every one of you."